VMCJ-3 was commissioned on 12 December, 1955 at MCAS El Toro, CA. It marked the merger of VMC-3 and VMJ-3 which consolidated the Third Marine Aircraft Wing’s electronic warfare and photo reconnaissance capabilities into a single squadron. The two legacy squadrons had moved to El Toro from MCAS Miami (Opa Locka) with the 3rd MAW earlier that year. At standup, the squadron was assigned the RF9F-6P Cougars for photo reconnaissance and AD-4NL and AD-5N Skyraider ECM aircraft for the EW mission. VMCJ-3’s tail code was TN. The first CO was Lt. Colonel William Adams. Perhaps most importantly, VMCJ-3 inherited the two prototype F3D-2 Skyknights that had been undergoing conversion to the EW or “Q” variant by VMC-3 avionics personnel to provide the Marine Corps its first tactical jet EW platform. These prototypes, BUNO 124620, and 125786, were officially reported as F3D-2Qs in February, 1956. After the successful testing of the ECM suite, which was essentially the same as the AD-5N, against simulated threat radars at Edwards AFB, White Sands Missile Range, and NAS China Lake, a recommendation was made to the Director of Aviation, HQMC to modify 36 F3D-2s based on the prototype configuration with 12 to be assigned to each of the VMCJ squadrons. According to John Cleveland, who was a young avionics technician in VMC-3/VMCJ-3 in 1954-56, the modification effort was under direction of the avionics officer, Capt. Noble, but led by WO Joe Bouher, an electronics technician and ECMO (A pioneer in Marine Corps ECM dating back to 1950 in the TBM-3Q Avengers at MCAS Cherry Point) who had also performed early modification of AD-2Qs in Korea. Although official records have not been located, it appears from accounts by Cleveland and others that at some point the aircraft were flown to Douglas Aircraft at Long Beach where the prototype design was formally documented as Airframe Change 173. Official aircraft custody cards reflect the modification program being executed by the Naval Air Rework Facility (NARF) North Island, CA. with the deliveries of the “production’ Q variants beginning with BUNO 124602 in December 1956 to VMCJ-3. In August, 1957, Lt. Colonel Robert Reid took over as CO. With the transition to the F3D-2Q complete and newer RF9F-8Ps assigned Lt. 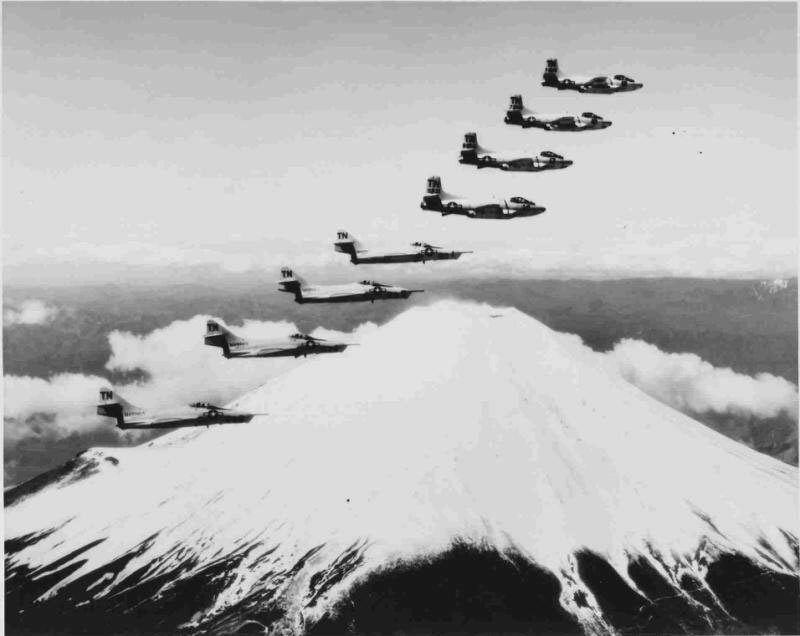 Colonel Reid began to prepare the squadron to deploy to MCAS Iwakuni, Japan in August of 1958 for a 15 month tour. This was the first operational deployment of a VMCJ squadron and the last for VMCJ-3. VMCJ-3 relieved VMJ-1, the last of the pure photo reconnaissance squadrons, and with its “new’ F3D-2Q EW aircraft began a new era in Marine Corps aviation history. Lt. Colonel Reid was instrumental in carving out a peacetime electronic reconnaissance role for the 9 F3D-2Qs deployed to Japan. He was able to convince the Commander-in-Chief Pacific to allow the aircraft to join the Peacetime Aerial Reconnaissance Program (PARPRO) and the squadron began to fly missions along the periphery of North Korea, Russia, and China under the nickname Sharkfin. The Sharkfin missions were usually flown by 2 F3D-2Qs staging out of bases at Misawa in Northern Japan, Osan, Korea and Tainan, Taiwan. These sensitive missions were tightly controlled and required detailed reporting. The Electronic Intelligence (ELINT) collected included tape recordings of intercepted radar signals that were forwarded to the PACOM ELINT center at Fuchu, Japan along with hand drawn plots of radar locations and signal characteristic data logged by the ECMOs. The Sharkfin missions not only helped fill in information on the employment of radars by our Cold War adversaries but provided and excellent training environment for VMCJ aircrews that paid off when VMCJ-1 was deployed to Vietnam in April, 1965. VMCJ-3 was relieved by VMCJ-1 in November, 1959 and returned to MCAS El Toro where it remained until decommissioned in August 1975. From 1960 until 1965, VMCJ-3 served as the main training base for annual deployment of cadres to the Pacific to relieve VMCJ-1. The squadron transitioned to the RF-8As in 1960 and in 1965 received the first RF-4B, completing that transition in 1966, and sent the first RF-4B cadre to VMCJ-1 at Danang, RVN. In June, 1970, the last EF-10B in the Marine Corps inventory, bureau number 125618, was flown to Quantico by the MAG-33 CO Colonel O.R. Davis who had shot down the first MIG-15 with an F3D-2 in Korea. It remains there today. VMCJ-3 did receive the EA-6A aircraft later in 1970 but struggled to keep them operational ready due to demands for parts for VMCJ-1 and VMCJ-2 aircraft deployments. VMCJ-3 became VMFP-3 in August, 1975 which began another chapter in Marine Corps aviation history.